The FD1781 was designed for double density, but required external modulation and demodulation circuitry, so it could support MFM, M2FM, GCR or other double-density encodings. The FD1791-FD1797 series added internal support for double density (MFM) modulation, compatible with the IBM System/34 disk format. They required an external data separator. The WD1761-WD1767 series were versions of the FD179x series rated for a maximum clock frequency of 1 MHz, resulting in a data rate limit of 125 kbit/s for single density and 250 kbit/s for double density, thus preventing them from being used for 8-in (200 mm) floppy drives or the later "high-density" 5.25-inch (133 mm) or 90 mm floppy drives. The WD2791-WD2797 series added an internal data separator using an analog phase-locked loop, with some external passive components required for the VCO. They took a 1 MHz or 2 MHz clock and were intended for 8-inch (203 mm) and 5.25-inch (133 mm) drives. The WD1770, WD1772, and WD1773 added an internal digital data separator and write precompensator, eliminating the need for external passive components but raising the clock rate requirement to 8 MHz. They supported double density, despite the apparent regression of the part number, and were packaged in 28-pin DIP packages. The WD1772PH02-02 was a version of the chip that Atari fitted to the Atari STE which supported high density (500 kbit/s) operation. After production at WD could not be sustained, Atari decided to license the design and modify it to get high density and extra density (1MBit/s) operation. The chip was codenamed "Ajax", had the number C302096 and was produced by Toshiba. VL177x series from VLSI Technology. These families were used in many microcomputers and home computers including the Radio Shack TRS-80, Acorn Electron, BBC Master, Atari ST, Acorn Archimedes and the SAM Coupé, as well as the +D and DISCiPLE disk interfaces for the Sinclair ZX Spectrum, the Commodore 157x/1581 for the Commodore 64 and the Atari XF551 for the Atari XL/XE. ^ Michalopoulos, Demetrios A (October 1976). "New Products: Single-chip floppy disk formatter/controller". Computer. IEEE. 9 (10): 64. doi:10.1109/C-M.1976.218414. 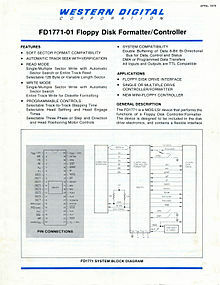 "The FD1771 is a single-chip floppy disk formatter/controller that interfaces with most available disk drives and virtually all types of computers." ^ "Recent IC Announcements". Computer. IEEE. 9 (10): 66. October 1976. doi:10.1109/C-M.1976.218417. The FD1771 was announced on July 19, 1976, and sold for $60 each in lots of 100. ^ Guzis, Charles P. (2009-09-13). "Durango GCR". Sydex. Archived from the original on 2017-03-25. Retrieved 2017-03-25. ^ "Recent IC Announcements". Computer. IEEE. 10 (12): 140. December 1977. doi:10.1109/C-M.1977.217618. The FD1781 was announced on September 21, 1977. Supported Dual density; accommodates MFM, M2FM. ^ "Dual Density Floppy Controller Chip". Byte. 3 (3): 216. March 1978. This page was last edited on 18 June 2017, at 20:45 (UTC).